This isn't a stitching finish, but a finishing finish, which is a big deal for me! I never finish anything! 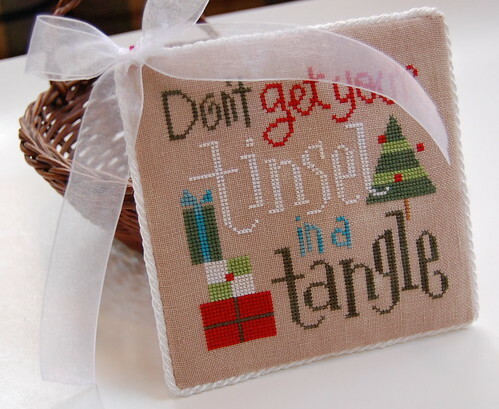 I decided to make "Don't Get Your Tinsel in a Tangle" into a pinkeep. Only I can't find my pins. So it's a pinkeep minus the pins! I used the finishing technique I learned from Jane Timmers. I just hate finishing. I find no enjoyment in it what so ever, which is why I barely ever finish anything! Oh well, it's done and I'm glad. I think Vonna would be proud! LOL! :) Write later! It is beautiful!! You don't need the pins. I love the bow. Looks great to me. If you don't find your pins and you have some long straight pins and various sizes of beads you can make your own pins. I've done that before and it works wonderfully. Another congrats on a beautiful finished finish!! That's one of my favorites, Vonna! You did a great job with the finishing. How cute! Your blog is beautiful and your photos always look perfect. I dread finishing also, but it is my goal this year to "get over it". I could stitch forever and never finish a thing(!). I think Vonna would, indeed, be proud. You did a lovely job! Congratulations! Love your new pinkeep! Great job finishing! Nicole, no one would ever know you hated finishing from looking at that lovely piece! It's great! The one below it is beautiful too. Your stitching is perfect! Yippee skippee! Good job on the finishing! I hate to finish finish stuff too! No fun. Let me stitch. Keep the glue and the sewing machine away from me. Nicole it turned out great!!! no need for pins in it, it is gorgeous! DOnt' you just love the technique Jane taught us. I am LOVING it. i have finished a few things using her technique and really happy with it. Your finish is so pretty!!! I love the colors in this pattern and the white finish is just perfect!! Gorgeous and I love it without the pins ! This is gorgeous - I loved your other finish, too! Pretty work, pretty pictures... you have one of my favorite-est blogs! A beautiful finish with or without pins! Beautiful job with the finishing. oh wow that looks absolutely gorgeous Nicole! Let me tell you a secret....I hate finishing too! You did a great job on this! I have this pattern too and you've inspired me to drag it out! I love white code and ribbon on the corner so much! Oh I love it!!!! Great job! It's lovely. I also hate finishes because I'm good at cross stititching but a terrible mess at sewing. You did a stunning job of it, and I love how you put the bow on it!